A wild seal, believed to be Guadalupe Fur Seal, was found trapped in a fishing net on the shore by a beachgoer was rescued by two Ocean Shores police officers on Monday. Tagged under threatened species, this beach seal is said to be rare to the northwest and is commonly found off the coast of Mexico. Reasoning that wildlife officials may take longer to arrive, the officers, Sgt. Watson and his partner, Officer Chris Elia, started working on the rescue despite not being trained for such an eventuality. While Sgt. Watson pulled started cutting the net with a knife, his partner held the seal from biting them by holding on to the net. This was also done so that the mammal doesn’t get caught in it again. The video has Sgt. Watson repeatedly reassuring the seal, “It’s ok buddy, it’s ok,” as he tries to cut his way through the mangled mesh. Eventually, he gets to the neck which he deems “the complicated part” as the seal appears to be constantly trying to bite them in self-defense. Officer Elia then using a catch pole tries to keep its head down while Sgt. Watson cuts loose the last piece of the plastic netting. As soon as it got freed, the seal can be seen hopping back into the Pacific. The rescue took about four minutes. According to Seal Sitters Marine Mammal Stranding Network (SSMMSN), seals are protected by the federal Marine Mammal Protection Act (MMPA). On spotting of any such stranded mammal, it is advised that one watches them from far and contact concerned authorities. Taking pictures for documentation is alright. Cascadia Research Collective too advises the same to beachgoers who find mammals in distress on beaches. 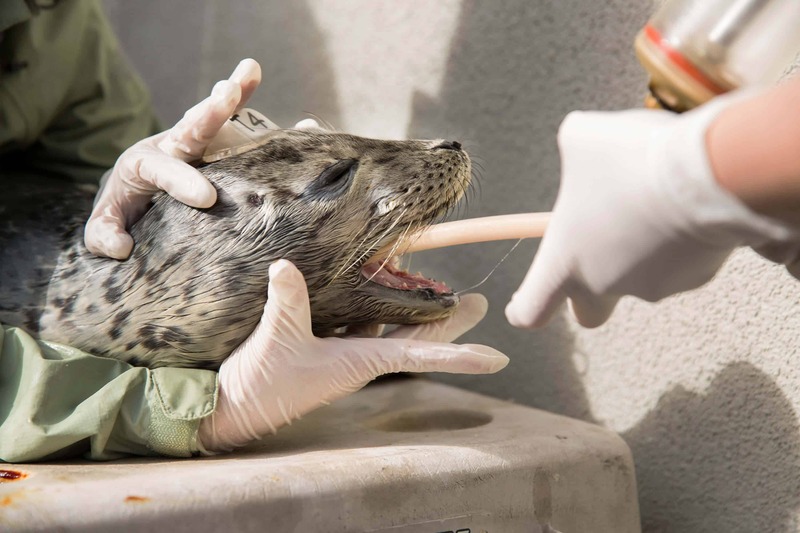 It notifies: To report a dead, injured, or stranded marine mammal anywhere in Washington State; please call the West Coast Marine Mammal Stranding Network Hotline at 1-866-767-6114.